Gorm was once a magnific and peaceful island full of nature loving people. However, the peace did not last as the Lord of Magma set out to destroy the entire island and all of its inhabitants, erupting a huge volcano called Fire Mountain. Only the wise old Sage survived the devastation and whilst mourning the loss of the once beautiful land, four new Gormiti tribes were born from his extraordinary magical tears. The new creatures came to life and rebuilt the island to its former glory. 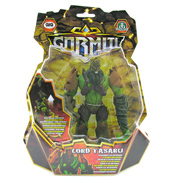 Four Lords of Gorm were created to rule over these new tribes, Earth, Forest, Sea and Air. Angered that his plan had not worked Magmion, the Lord of Magma, continued to plot. His aim, now, is to enslave the people and rule over the whole of Gorm himself. Creating his own tribes, Magmion worked to turn the other tribes against each other by causing conflict and distrust amongst them. Once separated and weakened the Gormiti tribes would be easier to defeat. Can the Old Sage’s dream of peace be restored? Which heroes will emerge in this titanic struggle? Who will survive and claim the Island of Gorm? Hard to believe that this is a range of toys that is based on a concept that started out as just a trading card game! Created in Italy in 2005, Gormiti now has its own television series.